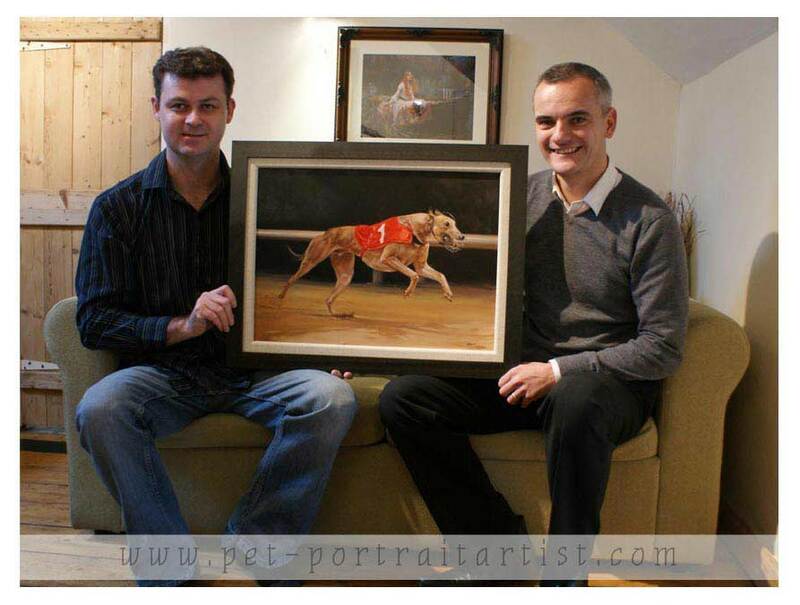 Mike contacted us to ask if we would paint a portrait of their greyhound called Express Shuttle. Mike had a wonderful photo that Nicholas worked from which you can see below. We are absolutely thrilled with the way this painting has come out, Nicholas' aim here was to create movement in the dog. 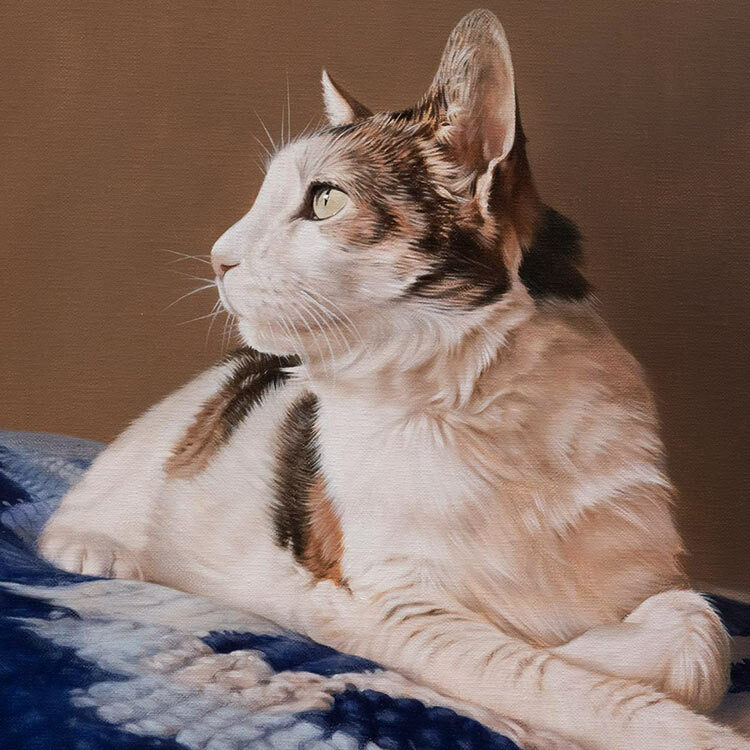 The last thing we wanted was for it to be a static or clinical scene, so Nicholas has painted in such a way that the back legs are slightly out of focus to show motion and blur. He has also used broad energetic brush strokes for the ground to again create movement and not detract from the amazing look in Shuttle's eye. 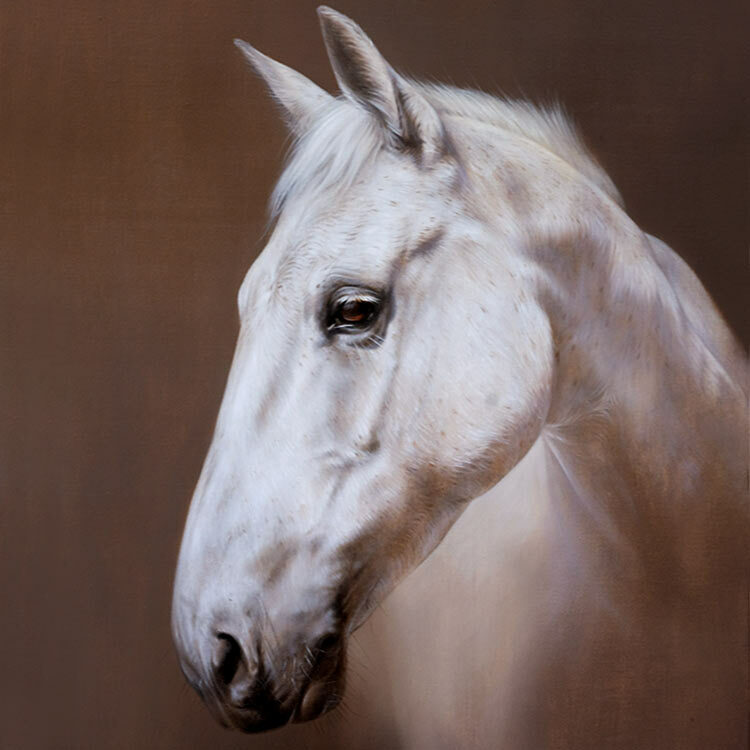 The focus is definitely on the face and front legs, we feel Shuttle is almost jumping out of the canvas. Mike travelled 3 hours to our studio to collect the painting and prints and you can see him with the original along with Nicholas below. Hi Melanie and Nicholas, I can honestly say that since we started the "SHUTTLE" project it has been such a lovely process. We have never had a painting commissioned before and didn't know what to expect, let me say its been such a great experience! I have especially liked following the stages on your blog and Facebook. You have been so helpful for absolutely every stage!The final picture has left us speechless and we now just cant wait to collect it and show it off. Thank you both so much, I hope one day we are lucky enough to own another great dog like SHUTTLE and work with you again! Facebook comment - Michael wrote:"o my god!!!!! looks amazing, can't wait to collect the picture." Facebook comment - Michael wrote:"Amazing! Thank you, very emotional!" Facebook comment - Michael wrote: "Just stunning!"